Over a thousand people who had gathered in Manokwari on Tuesday (2/10) to demonstrate in support of the independence movement in Papua were attacked by police who fired tear gas and live ammunition in the air, after hundreds of banned Morning Star independence flags were unfurled. The rally, called by the West Papua National Authority (WPNA) under the auspices of the national Federal Republic of West Papua (NRF-PB), was to show support for an observer mission to the General Assembly of the United Nations in New York by WPNA diplomat Herman Wainggai, and to reject the failed implementation of Special Autonomy (OTSUS) in West Papua. The rally was held at Sanggeng sports stadium from about 10 am local time, where about 700 people were joined by a long march of about 300 demonstrators who proceeded towards the town. Banned Morning Star flags, which were hidden whilst the rally was under guard at Sanggeng stadium, were provocatively unfurled in their hundreds during the march, and police reacted quickly and brutally at 1039 local time. West Papua Media stringers at the rally reported that Brimob paramilitary police stormed the gathering, firing their weapons both in the air allegedly with live ammunition and at rally participants with rubber bullets. Three tear gas canisters were also fired into the crowd to disperse them, and police conducted a baton charge at around 1045am. Witnesses however claimed that security forces, including soldiers from the Indonesian army (TNI) were firing indiscriminately, however no live gunshot wounds have so far been reported. However, several live bullet casings were recovered by West Papua Media stringers. Scores of demonstrators were savagely beaten, with several reportedly seriously injured by Brimob police who were seizing the 150 Morning Star flags. Several of these included elderly people, who tried to intervene whilst Police were brutally beating a speaker named Zet Tata. Ibu Pendeta (a Priest’s wife) Mathelda Maniani – one of the rally speakers – , Ibu Anis (75 years old), Petu Worabay, Vebi Wanma and Edo Kamesfle were all beaten by police. Zet Tata reportedly sustained serious injuries but his condition in currently unknown. 3 rally participants remain unaccounted for, though sources on the ground have unverified reports that they were taken by Police, and grave concerns are held by WPNA activists for their safety. The names of those disappeared are unknown at this stage. After the brutal intervention by police to seize the Morning Star flags, demonstrators dispersed, but regrouped to hold another long march in defiance of police and close the rally peacefully at 1pm. According to sources, armed Indonesian police and military have conducted rolling raids on motorbikes across villages including Mantembu and surrounding hamlets outside of Serui town, seeking to arrest all those who were involved in the mass flying of the banned Morning Star independence flag. It is not known if the troops belong to the Australian trained anti-terrorist Detachment 88 or POLRI Gegana (Motorbike anti-terror commando) units, but those being targeted were simply engaging in peaceful acts of free expression – guaranteed under Indonesian Law. 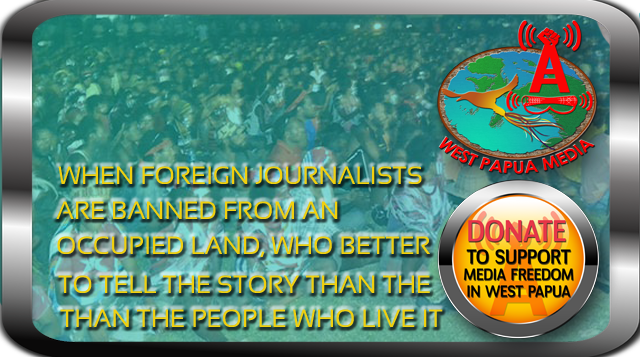 All contact with local sources has been lost, and West Papua Media is concerned for the safety of our stringers. This information is unconfirmed to West Papua Media’s normal standard of confirmation, however we believe the information is credible. This is a developing situation. Please stay tuned. More information as soon as we receive and verify it. 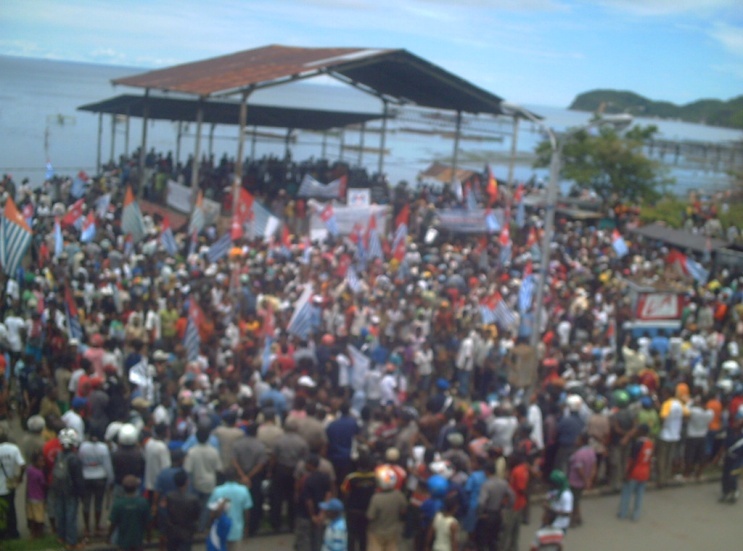 Over 400 Bintang Kejora (Morning Star) flags were flown by scores of people on a demonstration in Tanggal, Serui, West Papua. According to media sources, they were demonstrating to express support for launching of a US branch of International Lawyers for West Papua (ILWP) – this is spelt out as the International Parliamentarians, not Lawyers – in the United States. 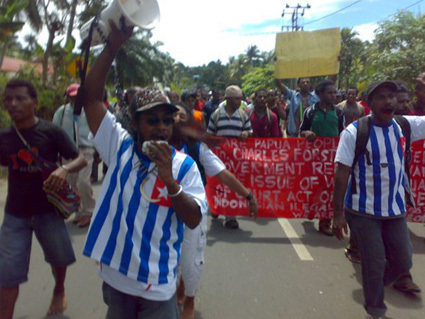 However sources on the ground confirmed to West Papua Media that the demo was carried out by over 5000 people in support of the Federal Republic of West Papua, and demanded full international legal recognition of Papuan’s desire for independence and to uphold the universal right to self-determination. Confirming the event, Aston Situmorang of the NGO Working Forum of Cenderawasih Bay said that thousands of people had gathered to take part in the demonstration from all parts of the district of Serui. The participants first gathered in three places and then converged on the location of the demonstration. After they had made their way to Tanggul, a number of speeches were delivered in support of the ILWP. When the local chief of police was contacted regarding this demonstration, he denied that anyone had flown the kejora flag. ‘No such thing happened,’ he said. ‘It’s a lie.’ He said that people marched together but no flags were flown. The demonstrators had only carried banners expressing support for the establishment of the ILWP in the US. Organisers of the demonstration contradicted the police version of events, claiming several groups of up to 470 flags (in each group) were flown, after Police and military attempted to blockade the rally with force. However given the sheer number of flags, security forces did not attempt to intervene and allowed flags to be flown, an act which carries severe prison terms under the provisions of makar (treason). A successful tactic employed by rally participants was mass body painting of the Morning Star flag, an act that although challenging makar provisions remains unenforceable under Indonesian Law. According to another report about the demonstration in JUBI on the same day, the local police chief in Serui had allowed fifty flags to be flown at the demonstration. According to the organisers, the majority of the participants were waving flags. Aston Situmorang said that demonstrators had come from all parts of the district; some were arrested in several places in the town centre, but they were not held for long and after being released, they were able to rejoin the demonstration. As they arrived at the location of the demo, a number of people made speeches.. Many of the participants had walked a long distance from Mantembu, with the whole march proceeding peacefully. After the speeches had been made, they dispersed. The local chief of police, Yohannes Nugroho Wicakasono, said that the demonstration had been organised by the West Papuan National Authority (WPNA) and had proceeded peacefully, lasting from 9am till 1.30pm. He said that kejora flags had been flown, but after they had been given warnings, the flags were taken down, collected and put away. A more senior police chief in the town of Seruis, Daniel Prio Dwiatmoko denied that kejora flags had been flown, saying that the demonstrators had only carried banners expressing support for the ILWP which has just been set up in the US.